[SatNews] The most recent series of payloads sponsored by the Center for the Advancement of Science in Space (CASIS) successfully berthed to the International Space Station (ISS) onboard the Japanese H-II Transfer Vehicle (HTV-5). 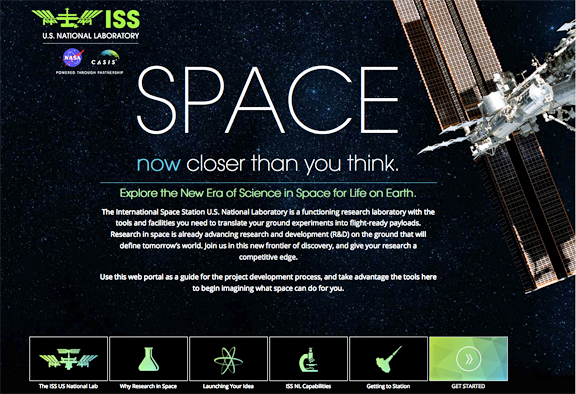 CASIS is tasked with managing and promoting research onboard the ISS U.S. National Laboratory. NanoRacks External Platform will be the first commercial platform capable of leveraging the extreme conditions outside of the ISS. After a joint agreement with CASIS in 2012 on the development of this device, the external platform will provide a variety of ISS National Lab researchers access to the unique environment of space in disciplines such as materials science and biological sciences over the coming years. NanoRacks-AAUSAT5 will use a student-designed and constructed Automatic Identification System (AIS) receiver to track ship signals with a small satellite launched from the ISS. Results will validate the software and hardware for a space-based AIS system, and inspire students to develop a deeper connection to the space program. AAUSAT5 Student Team, Aalborg University, Aalborg, Denmark. NanoRacks-GOMX-3 tests a small satellite with an advanced antenna-pointing system and a variety of communications capabilities. The satellite contains three radios, one of which receives beacons from commercial aircraft to improve air traffic monitoring. Two radios test reception and data downlink in the L-band, used by GPS satellites, and the X-band, used by the military and for weather monitoring, air traffic control and other uses. Principle investigator, Kim ToftHansen, Gomspace, Denmark. NanoRacks-Planet Labs-Dove is a fleet of nanosatellites deployed from the ISS to take images of Earth from space. The satellites are designed, built and operated by Planet Labs Inc., which provides the imagery to a variety of users. The satellites focus on areas within 52 degrees of Earth’s equator, where most human populations and agricultural areas are located, and they revisit the same areas more frequently than any existing government or commercial satellites. The images have several humanitarian and environmental applications, from monitoring deforestation and urbanization to improving natural disaster relief and agricultural yields in developing nations. The principle investigator is Robbie Schingler of Planet Labs, which is based in San Francisco, California.